It’s easy to apply the term “playing with house money” right now. It just is. I’m as much of a build the foundation, think long term, Trust The Process kind of fan as you’ll find. I love the climb. I love tanking. I love watching the growth. I love being along for a long journey. I’m all for it. But we’re past the point of thinking like that. 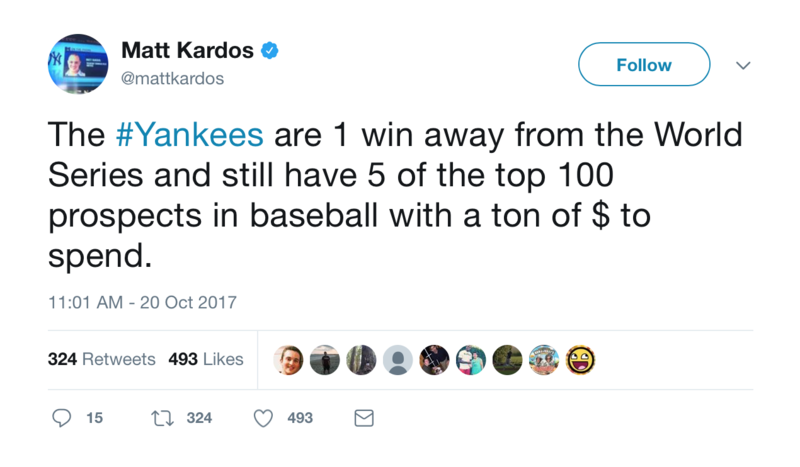 The Yankees aren’t lucky to be here so soon – they should be. They’re a better baseball team than the Houston Astros. Their lineup is just as dangerous. Their rotation is just as quality. And even if you disagree with both those takes… even if you think this is just an untimely slump from the Astros… beliefs that are more than justifiable… the difference between these bullpens more than closes that gap. So as cool as it is to see that tweet. As fun as it is to think about the future. As insane as it is to remember that they still have Gleybar Torres–the single best prospect in baseball–on his way into the lineup next year, and Clint Frazier, and Chance Adams, and Estevan Florial, and Justus Sheffield, and Miguel Andujar, and Domingo Acevedo. As dope as it is that the core of this lineup — Judge (25), Gary (25), Didi (27), Starlin (27), Bird (24) — is all 27 or younger. As nice as it is to know that Chapman, Robertson, Kahnle, and Green (no hard feelings Dellin) will all be back to run back the best bullpen in baseball. As crazy as it is that our ace is 23, and that with only $114 million committed in salary next year and very few holes, they can focus all their efforts on Japanese phenom Shohei Otani to add to the top of the rotation with Sevy. As cool as all that is… it doesn’t matter right now. All that matters right now is what’s before “and” in that tweet. One win. One win tonight and we’re in the World Series. Sooner than expected, sure – but far from surprising. Long term success is anything but guaranteed in baseball. There is no house money. So don’t think about our young core, or still-loaded farm, or young ace, or stacked bullpen, or bottomless wallet that we honestly don’t even need to use because we’re so goddamn loaded. It’s all about now. About tonight. About starting a “rebuilding phase” with a World Series just like we did 21 years ago today. This is it. Previous Ham’s Hoops Roundup Oct. 18th – BASKETBALL IS BACK!! !